Being considered to be , possibly, the Greatest Motion Picture ever created has to be as great a curse as it is an honor. For all those that have critically lauded 'Citizen Kane' over the years, there has been many that have been willing to disprove it's status as being ''the best''. This is perfectly understandable as it seems like human nature to buck the system and have an opinion that strays from the general consensus, but in all honesty it is hard to comprehend how anyone can deny the greatness of Orson Welles' unprecedented film debut. When famed newspaper tycoon, Charles Foster Kane passes away, his final words are revealed to be ''Rosebud''. The Media are in desperation to decipher it's meaning. It's truly incredible to think that a film of this grand magnitude, was created by a 26 year old in his feature film debut. 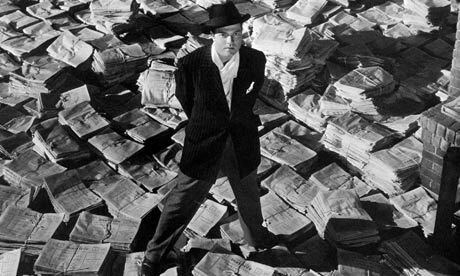 What Welles achieved with 'Kane' has become the stuff of legend, and efforts have more than earned their acclaim. The film is so ingeniously crafted, so precisely paced and so beautifully put together that it is mind blowing to think that this young man had never worked in the medium before. Welles' non-linear approach to deciphering Kane's mystery makes it all the more enthralling, and the scenes in which the reporter, Mr Thompson, is interviewing those who were integral parts of Kane's life could not have been orchestrated any better. Sure, the film may have still been great without them but with them it makes it all the more great. One of the most admirable aspects of 'Kane' is it's beautiful, and at times Gothic, look. From the stunning opening shots showing the exterior of Kane's palace, Xanadu, to the final scene the final scene inside Xanadu, Gregg Toland's fantastic Cinematography is just incredible, as is Welles' keen eye for camera placement. It would be foolish to talk about the film's cinematography without mentioning the great deep focus shot in the scene where Thatcher claims Kane from his poverty stricken family, there is shot in which the little boy Kane is in the far distance and can be seen through the window, while Thatcher, Kane's mother and father are conversing in the foreground, the beauty of the scene comes from the fact that everything single thing on screen is in sharp focus, which is awe inspiring considering the distance between the characters in the shot, it's a clever little example of Welles giving a hint to the audience about the film's final reveal, it's also things like this small attention to detail that make this film so great. The use of lighting is also phenomenal and completely enhances every scene it's used in, it was a brilliant move to distort the face of Mr Thompson with shadows for every shot he is in, and I took it to symbolize the ''faceless media''. 'Citizen Kane' is a film that focuses on an array of various themes, most notably corruption and consequences of being wealthy at a young age. While I never I personally never saw Charles Foster Kane as a bad man by any means, it is definitely evident that he is indeed corrupted, but no by any one person but wealth and greed in general. This was never Kane's fault but instead the result of being taken away from a loving family at such a young age. 'Kane' probably one of the greatest examples of a character study there is, the film is such manages to be such a thorough analysis of a character by technically using only flashbacks. 'Kane' succeeds at every sub theme it focuses on as well as having a majorly compelling main storyline. The film is the very definition of an ''emotional roller coaster'' with moments of overwhelming hapiness, inspiration and joy as well as instances of anger, heartache and sadness. 'Kane' conveys that wealth and fame are no substitute for love and compassion. In addition to being one of cinema's finest filmmakers and screenwriters, Orson Welles was also a gifted performer, as made clear by his immortal performance as Charles Foster Kane. I truly that no other actor, living or dead, could have portrayed the character quite like Welles did, his charisma, his outspokenness and legendary personality fit the character to a tee and results in Welles greatest achievement as an actor. Orson is well supported by his collaborated from The Mercury Theater, including the brilliant Joseph Cotten who plays Jedediah Leland, Kane's best friend, as per usual Cotten gives a wonderful showing. Another notable showing comes from Everett Sloane, playing Mr Bernstein, Kane's manager who continued to be loyal to him, is perhaps the most likeable character on screen.